On a recent show on Stand Up For The Truth radio, Dr. Randy White, who pastors a church in Katy, TX, was asked by the show host about the wisdom of Christians getting involved with conspiracy theories and conspiracy theory websites, which often involve poring over websites of corporations and performances of popular celebrities, and looking for hidden meaning in logos, symbols, costumes and "hand signals." This is often a hot topic every year around the time of the Super Bowl, when these websites hum with activity and get busy deconstructing costumes, lyrics and performances. Madonna and Beyonce's Super Bowl performances from a few years ago have been the source of much speculation, and right on cue, Katy Perry's performance from the recent 2015 Super Bowl half-time show also generated discussion, with some websites proclaiming that Perry is the woman who rides the beast from Revelation 17. Even MTV got into the action with a cheeky article about the Illuminati (19 Grammy Moments That Prove The Illuminati is Definitely Real...warning for coarse language). 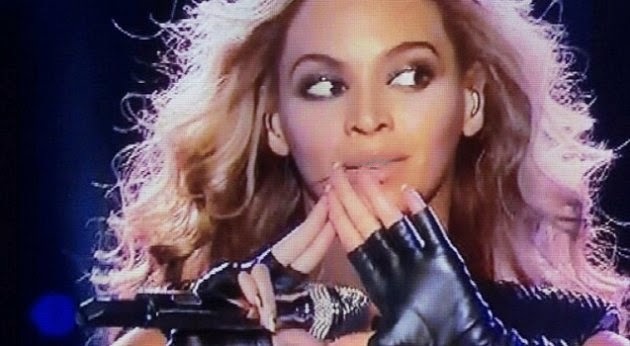 Performer Beyonce sending a secret Illuminati signal? QUESTION: One thing I do want to ask you, this is kind of my own brain here. I posted something on our Stand Up For The Truth Facebook page yesterday.....not meaning to, of course, disparage anybody, but just..... we don't focus here on things like symbols and the Illuminati and things like that. And that came up over the Super Bowl weekend when, you know, Katy Perry (performed) and there was a lot of symbolism and stuff. And I don't certainly fault anyone for doing that, but I think discernment, if you're going to be looking at things, what we've always done here is just hold things up to Scripture. So, you can look at Katy Perry's music and what she says she believes versus what she actually does, and hold it up to Scripture and discern that way. Could I just get your thoughts on symbols, Illuminati, that sort of thing? PASTOR RANDY WHITE: Yeah, I am not excited about conspiracy theories. There are so many that come about, and they begin to see things between the lines, and things that aren't readily noticeable in some sort of symbol or, you know, the way somebody raised their eyebrow or something, has to do with some ancient symbol or whatnot. I would much rather a Christian focus on what does the actual black and white in the (Bible) say? Become an expert in the Word. And don't--- it's just too easy to be snookered on all these things. There's no way to prove anything. There's no way to look at it. And we've got the facts right before us in the word of God. And it doesn't take rocket science to figure out that where our government is going is not according to the word of God. Do we have to know, you know, all the ins and outs of who's connected to who, and how this went back to that theory and this other theory? I personally don't. I just know it's unGodly. I don't trust the whole bag of it. And there are these economic conspiracies that are given. And too many Christians have honestly, spent a lot of money, and done a lot of things that were not economically sound because they got their economics from a preacher who didn't know what he was talking about, rather than look at the word of God, and then, economic principles, you know, from the word of God, are economic principles for the saved and unsaved. You've got to look at fundamentals as it relates here. So I'm one who would much rather look at the word of God and look at fundamentals, and go with that. The acceptance and study of conspiracy theories is not an activity that is edifying for the Christian walk. Yes, conspiracies exist, and the Bible even mentions conspiracies in several places. There was even a conspiracy to kill Jesus. But the conspiracies are mentioned in passing, and nowhere are Christians exhorted to study them. So what is going on with the Super Bowl performances? Obviously, we are living in a wicked time, a time that is becoming more and more wicked with each passing year. Our culture is hyper-sexualized. Many thousands of babies are murdered every year by being aborted. There is rampant fornication and immorality and violence all around us. In short, our culture has cast off all moral restraint. There's not even a pretense of it anymore. And so it's to be expected that the celebrities this immoral, hyper-sexualized, sensation-seeking culture chooses to build up and idolize will reflect those values (or lack of values). And they do. They sing songs with lyrics that celebrate wickedness, fornication and the latest cause du jour, normalized homosexuality. So should it really be any surprise that the performances of these celebrities at one of the most-viewed events of the year would be over the top in every way? That's what we know and can see plainly, and that's what we should be dealing with. We don't need to deconstruct costumes or hand signals in order to know that the lyrics of Katy Perry's songs are wicked. The lyrics celebrate bisexuality, and we don't need to do any code-cracking on a conspiracy website in order to know whether or not that's wrong. We can know it's wrong from God's word. Hysteria of this type is nothing new. In the 1980s, there was a widely circulated rumor that the CEO of Fortune 500 company Proctor and Gamble had publicly stated he was donating a portion of Proctor and Gamble's profits to the Church of Satan. This rumor took on a life of its own, and was widely repeated and whispered about for years. During this season of slander, the Proctor and Gamble logo was also widely deconstructed for evidence revealing the company's (alleged) connection to the Church of Satan. But this rumor, which continues to surface every few years, is completely false. (Read the Snopes article that documents this here.) And to go a step further, from a Christian perspective, for Christians to repeat this information without verifying it, is to bear false witness (transgression of the 9th Commandment). As we say often here, truth is important, because God is the author of truth. Truth is important to God, and so it ought to be important to us. This means that we have an obligation to verify whether things that we repeat are true or not. Is there a balanced way for Christians to view conspiracy theories, the answer is yes, there is. Simply put, it involves weighing actual evidence, and not just relying on anecdotal accounts or speculation or the first 10 websites provided by a Google search (or in the instance of an Illuminati Google search, the first 45 million websites). Of all people, Christians know that there is real evil in the world, and that we have a real Adversary, a real spiritual presence that is alive and well and active in the world today ("Be sober-minded; be watchful. Your adversary the devil prowls around like a roaring lion, seeking someone to devour." 1 Peter 5:8). But, we also know that a sovereign Lord rules and reigns over the affairs of man, and that what we are commanded to do is simple: contend for truth, love and serve our families and our churches, and share the gospel.